After Hat released their Celtic chariot sets I had been wondering what to do with my stockpile of the less sophisticated Airfix chariots. My solution has been to convert them into baggage carts. These will be useful as obstacles, objectives, or diorama pieces. I used thin pieces of white sheet styrene to build the cart's walls. Super glue bonds extremely well to the styrene, but it doesn't like the smooth brown plastic (my Airfix sets are 10-year-old Hat re-issues). The bags in the cart are sculpted with green stuff. The spoked wheel comes from an old box of Atlantic 1/72 Greek chariots. I was waiting to display this model after I painted it, but it looks like it will be waiting on my shelf for a while. Good idea! 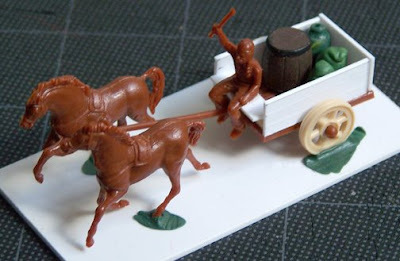 I've been thinking about converting mine into Sea Peoples baggage wagons, which had solid wheels and wicker work sides all round. I would need to make some wicker work sides for them and add some civilians, baggage and find a suitable driver. Thanks! Wicker sides would be great for variety. I'll bet little pieces of window screen would work well. Now, if I only had some spare scraps of the stuff. Your driver could be the legs of this Airfix celt with the torso of a Sea Person.